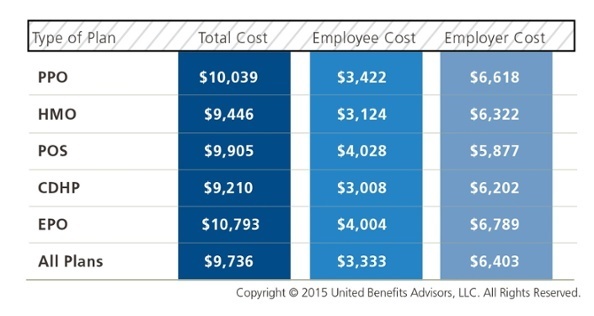 The average annual health plan cost per employee for all plans in 2015 is $9,736, a 2.4 percent increase from the previous year; employees picked up $3,333 of that cost, while employers covering the balance of $6,403. The average premium for all employer-sponsored plans was $509 for single coverage and $1,211 for family coverage. 20.6 percent of all plans required no employee contribution for single coverage (a 5.1 percent decrease since 2014), and 7.3 percent required no contribution for family coverage (a 3.9 percent decrease since 2014). For plans requiring contributions, employees contributed an average of $140 for single coverage and $540 for family coverage, which is only a slight increase from 2014 results – 3.7 percent and 5.5 percent respectively. Among all employers surveyed, more than half (53.7 percent) offer only one health plan choice to employees, with 28.7 percent offering two choices. As far as plan choices, preferred provider organizations (PPOs) continue to dominate the market (46.8 percent of plans offered and 54.8 percent of employees enrolled), and health maintenance organization (HMO) plans continue to decrease, as they’ve done since 2012 when they accounted for 19.1 percent of the market but now account for only 17.3 percent. Consumer-directed health plans (CDHPs) continue to show the greatest increase in growth, up 10 percent from 2012 through 2015. Most employers (72.5 percent) define full time work as 30 hours per week, and 7.6 percent define it as 40 hours per week. Only 9.9 percent of employers require fewer than 30 hours per week. Read UBA’s full press release announcing the initial findings. Pre-order a copy of the 2015 UBA Health Plan Survey Executive Summary which will be published soon with comprehensive data.